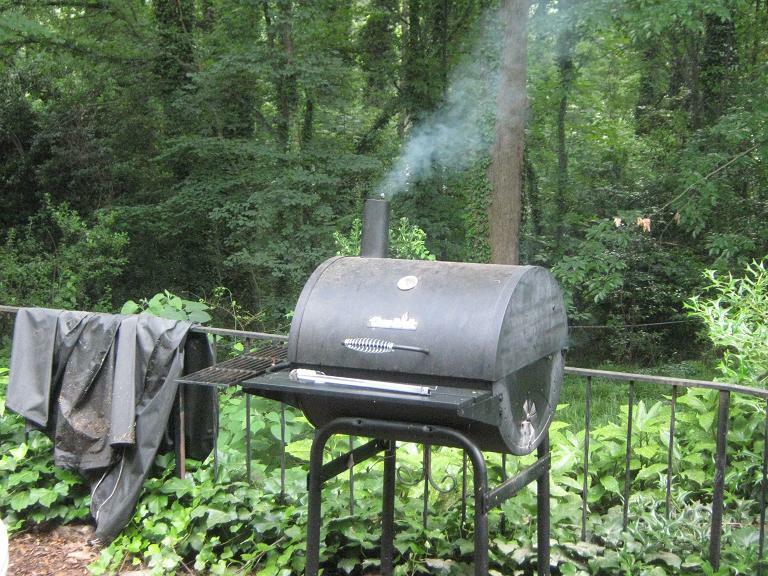 Memorial Day Weekend: Open Thread. What do you have in that rub, Paul? Some true American grub you have ready to fire up, I see. Well played. Just moved. Unpacking. No phone. No Internet :( No money orders. Can't pay rent. Or use more. Than three words. In a sentence. Seriously, is your town having a Memorial Day parade? We used to have them when I was growing up, but they seem to be being abandoned. Don't people care about history, anymore? I'll post some more pictures of the process. Just put the meat on. I'll pour out some Coors Original (the Golden Hammer, as the Colorado folks call it) in honor of the Masked Chicken in his dire predicament. No parade here. That's something I should look into proposing at the next neighborhood meeting. What's a good method (marinade, rub, sauce, etc.) for making barbecue baby-back ribs on the grill? 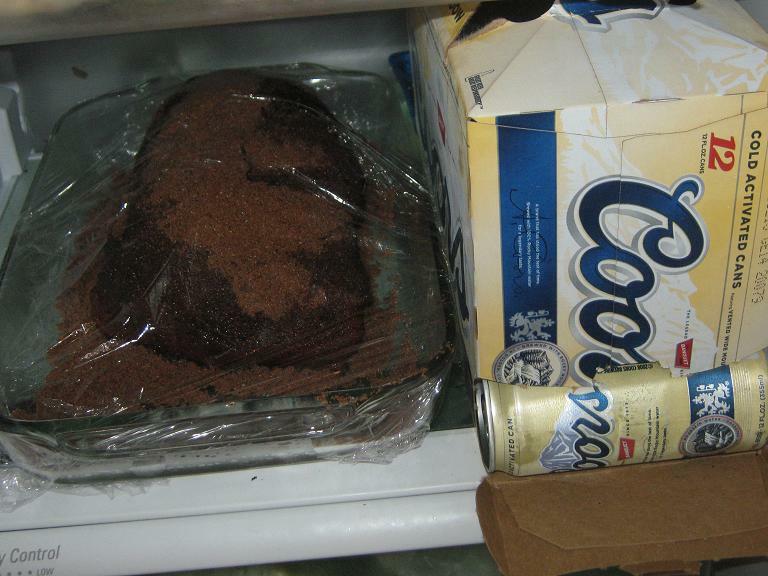 Is that chocolate cake or a steak in the container (hard to tell)? Don't forget the sunscreen. How hard is it to grill chicken? Just thought I'd ask. Fortunately, eating cow meat is more associated with celebrations than eating fowl. Ah, well, no fowl, no harm. Bucky -- not sure about ribs. Never grilled any myself. Chicken -- good grief. 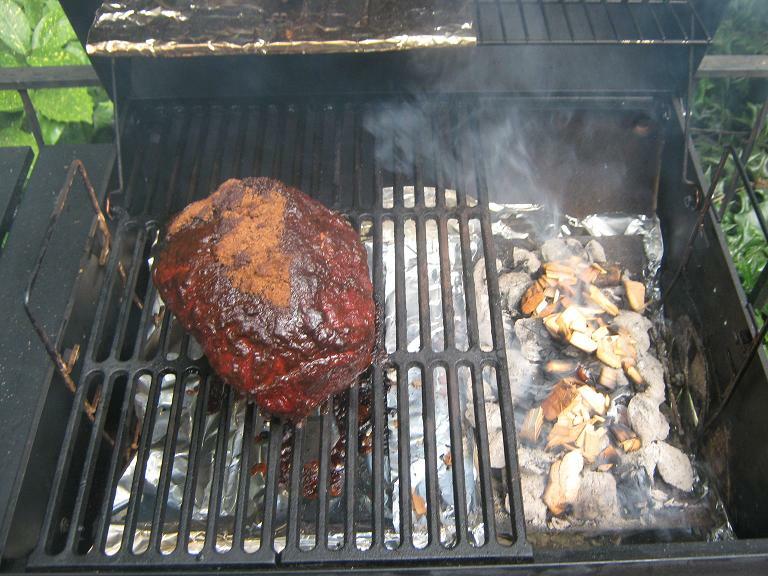 It's a pork shoulder, man. I can't believe you're drinking Coors. Denver has a Memorial Day Parade, even though it's on Saturday. And on Memorial Day there is the Bolder Boulder 10 K run (in Boulder CO! )ending with with a tribute to our soldiers and the branches of the armed services. http://www.bolderboulder.com/Run_Central/Memorial_Day_Tribute.htm. You can even get a bib to wear in honor of a family member or friend who served. I'm running in honor of 2 nephews, Steve and Jim and in memory of my beloved Uncle Dal. Good luck, Mom. God bless our servicemen. Bill and Patrick -- you shut up. Coors is a Colorado staple. 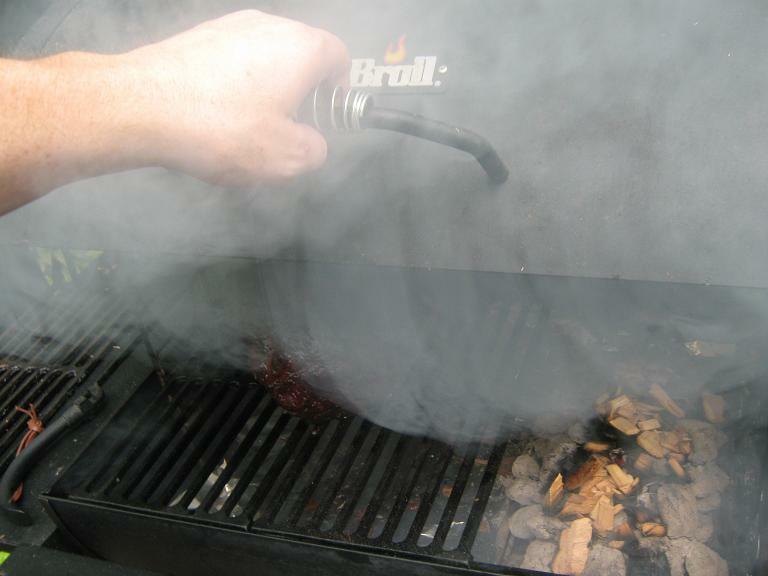 Convert your grill to a smoker, first and foremost, which isn't terribly hard--there are a thousand places online that can instruct you in how to do it. For sauces, I like to combine 1 8-oz bottle of Cajun Power Garlic Sauce with a bottle of any sweet BBQ sauce you can get at the store, like Stubb's (Hickory Bourbon is my favorite, but they're all pretty decent as these things go). Warm the sauce before basting the meat with it (which I like to begin doing 1 1/2 hours before it's finished to ensure it's "stuck on"). Thanks for the help on the ribs. They be smokin' at present. Ended up using this method pretty closely, and it turned out very well, if I can say so myself (my wife raved also). To do over, I would have cut back on the chili and mustard powder. It was a little too heated for my tastes, but for those with a heartier tongue, it would have been more than acceptable. I agree with Sage, conversion to smoker is a must. And then, I can't imagine how ribs can be done well without giving them much time. I had them on the grill for a good four hours, and after this run I think I would tend to even longer rather than shorter time. 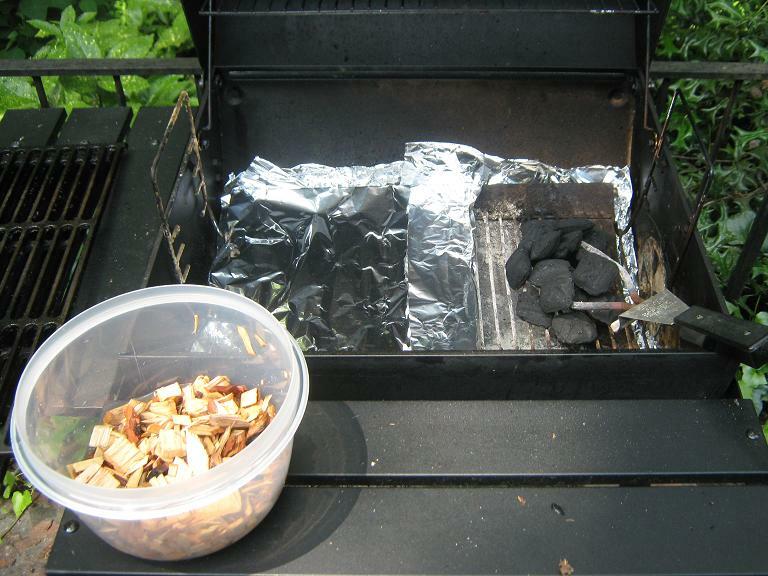 The charcoal chimney was indispensable. Here in Illinois, we appreciate the Banquet Beer, and I look forward to drinking it tomorrow. Coors! Blech! I can't believe anyone would drink Coors. It's like bad water. Sam Adams please. I have a theory that folks sometimes confuse Coors Light (an overly-marketed water-mimic of a beer which is available everywhere) with the Golden Hammer, Coors Banquet Beer, which is far less widely distributed. I would even wager than there are beer-drinkers who despise the Golden Hammer despite having never actually sampled. I'm not claiming this beer is in the class of Sam Adams or Bass Ale; I am only claiming that it is serviceable, and should not be confused with its pitiful "light" cousin. No, C***s L***t is an utter abomination, Coors is just ugh. Sorry, I can't really complain too much, as my hometown is now connected to Coors through Miller. I have a principled loathing of adjuncts used to cheapen the beer, thus destroying the wonderful flavor of barley. If I remember correctly, Coors uses rice, while Miller uses corn. Well so is spam in a can, but do you actually eat it? Finally got some boxes sorted from the move and the phone turned on. Have Internet. It rained most of the day in my parts. Everyone knows the best beer is made by Benedictine Monks. I stand by Coors Banquet. I have heard stories of the legendary Coors brewery being a favorite rest stop for cross country college travelers of the 60s and 70s. I love a good craft beer, but Coors is a great American Lager with a nice flavor. Sam Adams and small type brews are good, but the simple and clean flavor of a Banquet beer can really satisfy. Stop being beer snobs, appreciate all types; from the light lager, to the crisp pilsner, to the hearty stout, the brown ale, the ipa, and all other flavors. Never had Coors Banquet. I'll say for the record that I actually like Coors Light. I do have my limits though. "Coors it to beer what Congregationalism is to Christianity"
Hmmm. I just can't see that. I'd suppose Congregationalism would be like kit supplied home-brew (homogeneous yet independent) Non-Alcoholic (lack of Sacraments) beer. As for beer snobbishness, well, to some degree. I do home-brew however, and I do like a wide variety of flavors. Since it's getting warmer, I was considering a wheat beer next. Well, Congies do have Baptism and Marriage and they are Christians - just like Coors has Hops and Cereal Grains are is, arguably, beer.